Maryvelma O’Neil’s 2008-published Bangkok: A Cultural and Literary History is an eclectic, erudite and elegant glide through the history of Thailand, with a focus on its modern capital, Bangkok. Whether you’re visiting the kingdom for the first time, or you are an old Bangkok hand wanting to enjoy some of the finer anecdotes and interesting historical tidbits related to the city, this is a fine read, and an excellent companion to any nuts and bolts guide. We should disclose that the author is an old friend of ours, whom we met when living in Bangkok. MV, as we know her, gave us a “garland” thank you in the acknowledgements. Right back at you, MV, for a sterling, informative book that we still refer to and recommend to friends even almost a decade after it was published. Surprising fact follows surprising fact: Alexander MacDonald, an American attached to the Office of Strategic Security, loaned the gun that was responsible for the death of young Prince Ananda (and therefore the rise to the throne of King Bhumibol Adulyadej); the same MacDonald went on to found The Bangkok Post newspaper. The book proper begins in Part One with a focus on the royal side of Bangkok, starting with a look at the fates of the former capitals, Sukhothai and Ayutthaya. A chapter on The Grand Palace is so thorough you could almost be tempted to miss the crowds and just enjoy O’Neil’s descriptions instead (don’t, you should still go—just use this as your guide!). The River of Kings, or the Chao Phraya, has a dedicated chapter, with various descriptions of enthralled visitors describing its appearance throughout the centuries, from obscure British naval men, to Joseph Conrad, to Yukio Mishima. (Interesting fact: The water hyacinth you see all along the river was imported from Indonesia in 1872 by one of the consorts of King Rama V.) The klongs of Thonburi are then explored, followed by royal Rajdamnern Avenue, with a look at the historical events that have centred here such as the 1992 uprising at the Democracy Monument. Part Two shifts the focus to temples. Wat Arun, Wat Pho, Wat Saket and the Golden Mount and the Erawan Shrine are explored. Part Three explores the merchant side of the city: Sampeng Lane, New Road, migrants, and the Oriental Hotel. And Part Four looks at art and food. This is no disjointed pastiche of clips and quotes from historical characters (as is the style of less polished, but still interesting, Tales of Old Bangkok: Rich Stories from the Land of the White Elephant), but a smoothly narrated tale calling on the expertise of well known, and lesser well known, literary figures, observers and explorers through the centuries. O’Neil’s love of the city shines from these pages, with her humour adding a welcome touch. The true history fan will unearth a treasury of other books to track down on Thailand through the further reading list, too. 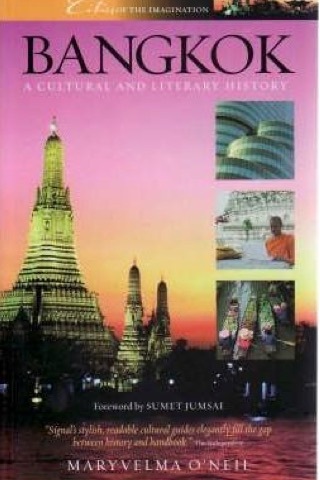 If you are daunted by the thought of visiting Bangkok, this book makes for a great read ahead of time. Armed with so much historical knowledge, you’ll have the confidence needed to jump on a commuter boat chugging along the Chao Phraya, sip on a cocktail at the Oriental and elbow your way through the crowds of Sampeng Lane. Pack a guidebook, and pack Bangkok: A Cultural and Literary History, and you’ll be miles ahead of other travellers in understanding something of this alluring, crazy town.